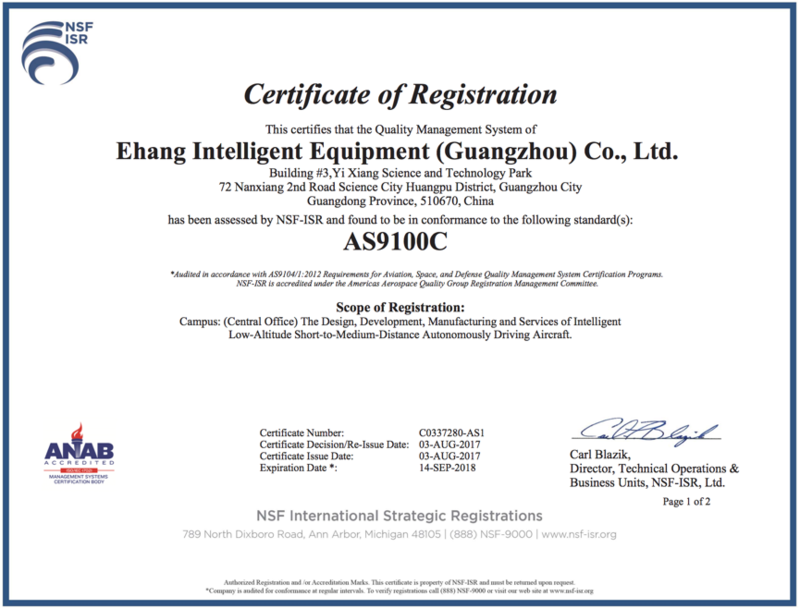 In August, 2017, EHANG was granted the AS9100C certificate, a qualify management systems standard adopted worldwide by the aerospace & aviation industry, by NSF-ISR, a leading global certification body recognized by the Registration Management Committee of the Americas Aerospace Quality Group (AAQG) through a rigorous assessment and inspection process. This signifies an authoritative approval of EHANG’s leading capacities in design, R&D, manufacture, production and service in the sector of low-altitude Autonomous Aerial Vehicles (AAV) to provide smart solutions for short-to-medium air transport. Compared with the ISO9000 quality management system, AS9100 is a more specialized international standard that entails specific requirements for aerospace/aviation and defense industries. This quality management standard has been widely recognized and adopted by global leading manufacturers including Airbus, Boeing, General Electric Aircraft and Rolls-Royce, as well as U.S. regulatory bodies such as the DOD, NASA and FAA. Obtaining the AS9100C certificate further upgrades EHANG’s quality management capacity on UAV technology & service, thus laying a solid foundation for EHANG 184’s future development in the civil aviation sector.